Flux is needed to prevent oxidation that tends to form when hot metals come in contact with the air. During printed circuit board repair and soldering, it's common to see liquid flux from the wave soldering equipment poured into jars and applied with an acid brush. More is better, right? Why not flood the rework area with flux and get the job done quicker? In reality, you may be creating more work, and possibly risking latent failures down the road. The excess flux that isn’t fully activated nor brought up to soldering temperature, can lead to corrosion and dendritic growth. It pays to find a higher precision method of applying flux. That's why flux pens are an excellent way to dispense flux for benchtop soldering. What Is a Flux Pen? Flux pens are valved, prefilled pens of flux. Flux pen avoids the mess and hassle involved in filling your own flux bottles. A flux dispensing pen contains the flux in the airtight barrel of the pen. Flux pens are an excellent way to dispense flux for benchtop soldering. Hold the pen vertically and briefly depress the tip to start the liquid flow. This will saturate the tip of the pen with flux. Draw flux on the area to be soldered. Gently press the tip again when more flux is needed to keep the tip damp with flux. CircuitWorks® No-Clean Flux Pens: The most popular flux pen is our CircuitWorks Lead-Free Flux dispensing pen because it is useful in a variety of applications. This no-clean flux is formulated to perform at the elevated temperatures of lead-free soldering but is also effective for tin-lead soldering as well. It's designed with a low surface tension to prevent bridging. Post-soldering cleaning is optional because the light residue left after soldering is barely noticeable is non-corrosive and halide free. In cases where removal is required, it can be easily removed with Flux-Off® Lead-Free Flux Remover. 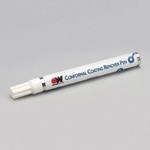 CircuitWorks No-Clean Dispensing Pen is a good choice for tin-lead soldering where cleaning is to be avoided. The light residue can be left on the board, or removed with the Flux-Off® No-Clean Plus Flux Remover. CircuitWorks® Rosin Flux Pen is a high solids type R rosin flux which provides excellent solderability in a wide variety of applications. The residue left behind is non-corrosive and is halide-free, but it is best to remove the residue after soldering for aesthetics. Flux-Off® Rosin Flux Remover will easily remove the flux residue. CircuitWorks® Water Soluble Flux Pen is a very active pH neutral ORH1 flux. It enables easy soldering of both lead-free and lead-containing solders. This flux must be cleaned and can be removed easily with DI water, like in a batch or in-line system, or benchtop cleaning with Flux-Off® Water Soluble Flux Remover. Each of the different flux removers mentioned formulated to remove a certain type of flux. 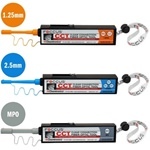 In many cases, a flux remover will work reasonably well on other types of flux, but best defluxing performance is achieved by using the appropriate flux remover. Tacky flux is a viscous, pasty form of flux that is easy to place without it spreading into surrounding areas the way a liquid flux can. It can be used to hold small parts in place before soldering and is common in the manufacture and repair of SMT components. Tacky fluxes in syringe dispensers provide for dispensing convenience similar to a pen in situations where a tacky flux better fits the application. CircuitWorks® Tacky fluxes are commonly used for a variety of applications. The thick, honey-like consistency is ideal for ball-attach applications, BGA re-balling and hand soldering SMT components. The flux is dispensed from a syringe and can be manually spread over the desired area for soldering. CircuitWorks® No-Clean Tacky Flux is a mildly activated rosin (RMA) no-clean tacky flux. Its formulation includes a unique rosin/resin blend coupled with a proprietary blend of activators and stabilizers, providing significantly increased shelf life and long-term product stability. The remaining residue is stable and can be left on a board without cleaning, or can be easily removed with Flux-Off® No-Clean Plus Flux Remover. 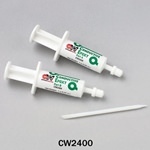 CircuitWorks® Lead-Free Tacky Flux is formulated for higher temperatures common in lead-free soldering. Regardless of the type of flux required in your PCB rework soldering process, there is a CircuitWorks® Flux Pen or Syringe for you. Contact Chemtronics at 770-424-4888 or contact us.